When Brightcove released a major upgrade to its online video platform last month, one of the new set of features was better analytics. 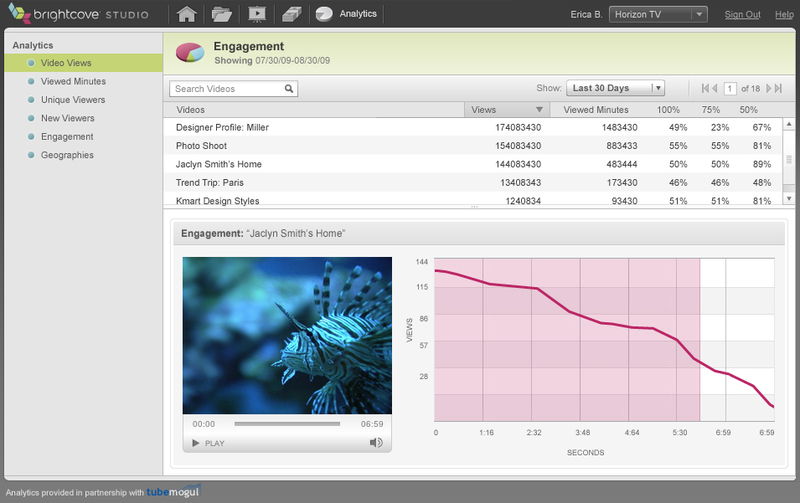 It turns out that Brightcove's new video analytics suite is powered TubeMogul. Professional video publishers who use Brightcove can now measure things like the geographic distribution of their viewers, how many seconds they watch each video, their drop-off rate, number of unique viewers, number of new viewers, as well as total video plays. The two companies have also signed a joint R&D pact to develop new video analytics products exclusively for Brightcove. TubeMogul will also become a marketing partner for Brightcove's paid video hosting, streaming, and advertising services. About 125,000 people use TubeMogul's free video analytics. Many of them are online video professionals Brightcove is hoping to turn into paying subscribers for its new "low-end" $99/month plan. When Brightcove released a major upgrade to its online video platform last month, one of the new set of features was better analytics. It turns out that Brightcove’s new video analytics suite is powered TubeMogul. Professional video publishers who use Brightcove can now measure things like the geographic distribution of their viewers, how many seconds they watch each video, their drop-off rate, number of unique viewers, number of new viewers, as well as total video plays. The two companies have also signed a joint R&D pact to develop new video analytics products exclusively for Brightcove. TubeMogul will also become a marketing partner for Brightcove’s paid video hosting, streaming, and advertising services. About 125,000 people use TubeMogul’s free video analytics. Many of them are online video professionals Brightcove is hoping to turn into paying subscribers for its new “low-end” $99/month plan. Analytics are an important part of the video equation, especially for advertisers and marketers who need to demonstrate the ROI of spending money on online video. TubeMogul already has an advanced analytics package Brightcove can plug into its latest release. TubeMogul adds Brightcove as a customer and will receive both R&D payments and marketing fees for each new Brightcove client it helps to sign up.